Recommended - Vetom 1.23 - liquid fraction does not contain sugar. In a bottle of 10 ml. This is about 120 drops. When considering that a standard dose of 5 grams of powder contains 5 to 10 million bacteria spores. In one drop, Vetom 1.23 has at least twice as much controversy. The species composition of the spores is identical to Vetom 1.1, Vetom 1.23. It means that it is possible to adjust the amount of the received Vetom by the volume of the liquid. This suggests that one bottle can accept standard doses from 200 to 240 ..
fine white odorless powder, soluble in water with white residue. Composition: Probiotic microorganisms — Bacillus subtilis recombinant strain VKPM V-10641 (DSM 24613). Corn-steep extract, potato starch, powdered sugar as excipients. Biological active substance Vetom 1.1 is used as an additional source of probiotic microorganisms to heal a human organism. A health-improving effect is provided by the properties of bacteria Bacillus subtilis. Reproducing mainly in the large intestine they produce proteolytic, amylolytic and cellulolytic enzymes; human leukocyte interferon alpha 2; bacitracins and other biological active substances which inhibit the growth and development of pathogenic and opportunistic microflora. 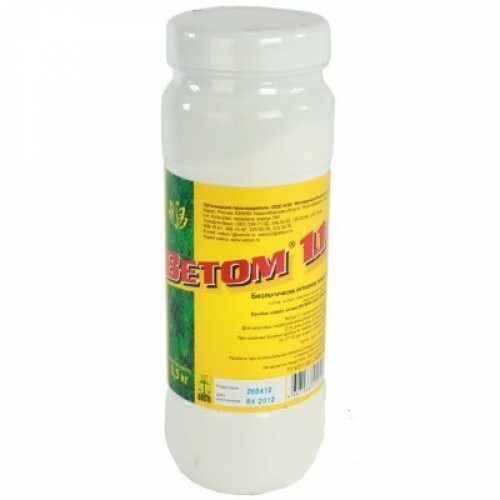 In taking Vetom 1.1 the processes of digestion, absorption and metabolism of iron, calcium, lipids, proteins, carbohydrates, triglycerides, amino acids, dipeptides, sugars, bile salts, and acidity in the gastrointestinal tract come to normal. Vetom 1.1 assists a human body to preserve health. Vetom 1.1 is taken through mouth. Vetom 1.1 dosage frequency directly depends on individual health status. The recommended dosage for healthy people is not less than 2-3 doses a week within 10 days. In the case of diseases the dosage frequency should be increased up to 7-10 doses a day within 10 days. Take Vetom on a regular basis. Vetom 1.1 does not cause habituation. Vetom 1.1 increases efficacy of medicinal preparations and decreases their side effects. A combined oral administration of Vetom 1.1 and antibiotics or preparations containing probiotic microorganisms is not recommended. The combined use of Vetom 1.1 and antibiotics is permissible if different routes of their administration are used, for example, oral intake for Vetom and injection for antibiotic. Don’t store above 30ºС and at relative humidity exceeding 75%. Omega-3 Fish Oil 1200 mg ( 360!!! mg Active Omega-3)1200 mg / 200 Softgels It's an essential po..